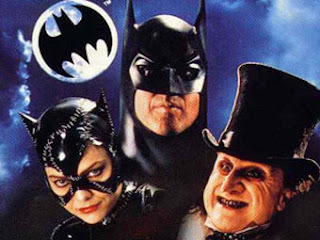 Crumb by Crumb: I just bought Batman Returns and watched it. OK, Once songs are up for real now. WHO'S CUTER: Leonardo DiCaprio or Ryan Gosling? The Actors Tournament is on! I have a crush on Ryan Gosling. I just bought Batman Returns and watched it. It was on sale for like $9 on amazon, so I figured, "why the hell not?" (it came in the same package as my Once soundtrack). I'd seen it once as a little kid (when it first came out), and I remembered it being cool, dark and scary. I'd also noticed that it was one of Nat's top five films of 1992, so I thought I'd probably love it. But I just watched it tonight, and didn't love it as much as I'd hoped. There were lots of interesting things happening, and the performances were all good (especially La Pfeiffer), but as a whole, it just didn't feel special. Certainly not Spider-Man 2-level. The villains were all sympathetic, which was nice, but they still felt less like real people and more like, well, comic book villains. I applaud the visual ingenuity, as well, but on the whole, the film felt rather stagnant; it just didn't thrill me. I guess my main quibble is that, entertaining as it was at times, it mostly felt like a bunch of fun gimmicks that didn't really hold together. Plus, it wasn't always that entertaining. The tragedy of Catwoman did get me a little, but my being truly involved emotionally was more the exception than the rule. I'd blame part of it on the film's age - the effects of the time were not as great, and there've been more interesting comic movies since then, so I'd imagine this seemed more innovative before - but I think it's also just that the film was not too inspired. Pieces of it touched on greatness, but the whole seemed less than the sum of its parts. It didn't really have a great story angle or themes to make it feel "mythical," and Burton tried to make up for that by adding on a lot of fluff. This film actually exemplified my main issue with Burton: that unless he's working with an exceptional story (e.g. Edward Scissorhands), his films are usually long on style and short on substance. His quirk and invention are fun, but not really focused. And it annoys me, truth be told. This is why I really worry for his rendering of Sweeney Todd. He may find inspiration in the strong material, but it could also just be a jumping off point for him to get pointlessly weird and gothic. We'll see. Anyway, don't get me wrong, I liked the film - even a lot, at times - but I guess I'd hyped it up a lot in my mind, and I ended up a tad disappointed. I guess it serves me right for buying a film I hadn't seen in fifteen years. Maybe if I watch it again, I'll change my mind? Who knows. Burton doing Sweeney Todd - now that's interesting - could be very spooky. I liked what you said re "Long on style & short on substance" - it's often so hard to achieve a perfect balance of the two - though I admire Burton's attempts to go beyond the norm. Yeah, I never particularly cared for Returns either. I know I'm in the minority, but I thought Forever was so much better: more entertaining and with more depth. One big problem with Returns is that Batman basically makes only a cameo appearance. It's also quite slow; not nearly as slow as Begins, but still much more than necessary for a "fun" superhero flick. I don't know if I agree about Burton. I think Beetlejuice is great. But perhaps I just like style over substance.